As the classic song says, Christmas is the most wonderful time of the year. 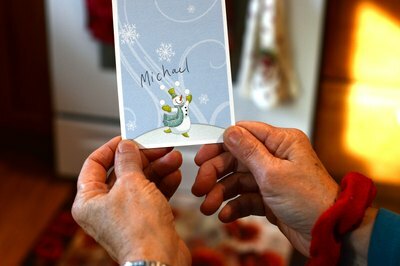 Families and friends gather together to exchange gifts and well wishes. To add a little more fun to the proceedings, many groups even come up with simple games to handle the rules for exchanging gifts. These games can assure that new friends or guests don't feel left out when there are gifts for everyone but them. They can even put a limit on the stress of the holiday season, as most of these games make it easy and reasonable to set value limits on gifts, ensuring that participants don't need to stretch their pocketbooks too far. Secret Santa is an old favorite. In the weeks before the big holiday, each participant is given, at random and in secret, the name of another guest at the holiday party. Their task is to buy a gift for only that person. No one knows who has their name, and the goal is to buy a gift uniquely suited to that person, even if it involves getting to know the person more than one already does in order to decide upon an appropriate gift. This game has a variety of names including Chinese Christmas and The Christmas Gift Grab. Each player brings one unlabeled gift to the party. 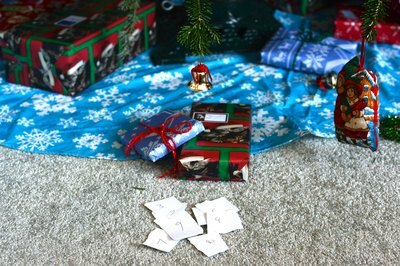 Players draw numbers to determine the order in which they may claim presents from under the tree. When a player's number comes up, they are given a choice between stealing another player's already opened gift or choosing a new gift from under the tree and opening it. Anytime a gift is stolen, the losing player is permitted to immediately steal any gift (besides the one just taken from him) from another player or open another new gift before play continues. A common rule variation limits any given gift to being stolen only three times. It is very common for the host to set gift rules in advance. Common rules include a maximum value for the gift, bans on gifts of alcohol or other material that may not be suitable for younger players or even the stipulation that all gifts must be gag gifts. 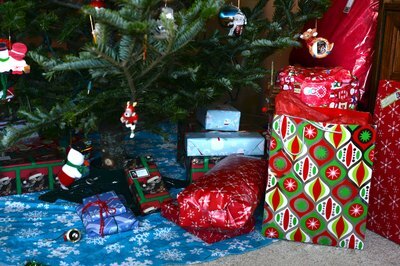 Chinese Christmas is poorly suited to young children, who may not understand the rules of the game and become upset when a desired gift is "stolen" by another player. Musical Gifts is a mix between Chinese Christmas and Musical Chairs. Each player brings a single, unlabeled gift to the party. The players sit in a circle and a single present is placed in the group. The host starts the music and players must pass the gift around the circle until the music stops. When the music ends, the person holding the gift is its recipient. They must open the gift, right then, and leave the circle. Play continues until there is only one gift left, which goes to the remaining player. The host should specify in advance which game will be played with the gifts, so that guests can purchase gifts that will not be damaged if they are dropped accidentally during the rush of the game. If the game will be played with a mix of children and adults, guests should be advised to purchase age-neutral gifts for the game.